By Kaffe Fassette in Rowan 38. First off, it took me a few years to find a copy of Rowan 38. The first time I tried to buy it, the guy reneged. I ended up getting it for a steal- I mean, they robbed me blind. $40 for the book- for one pattern. I kid you not. 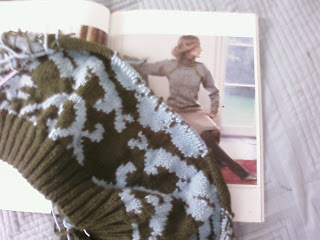 There is nothing else worth knitting in the entire book. If you find something, I'd be happy to sell it to you when I'm done. I'll give you a good deal too- not! This is the back. If it looks like spaghetti, it is. I can knit about 3 rows before having to untangle about 20 strands. 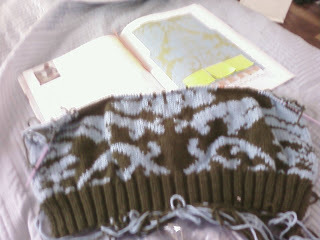 With Intarsia, you have to wrap the yarn at each color change to avoid holes. That means all the strands get wrapped up on top of being normally unruly. Some people knit big swatches of Intarsia and then embroider the details, but it's easier for me to just get it done all at once. 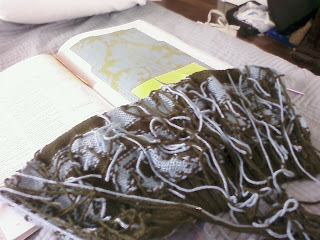 In all, it takes me one hour to knit three rows and untangle the mess. I don't even want to think about all the weaving in. Not to mention the pattern is on the back and sleeves as well. And take a lookey at the chart. Don't worry, you won't be able to read it unless you have the fake CSI tv- style infinite- zoom function on your computer. I can barely read it IRL. Those boxes are teeny-freaking-tiny and in moss green and turquoise. Why, Kaffe, Why!!!! Black and white would have been hard enough to see. Why choose two colors so close together for the chart? Oh, and hahahahahahaha- the pattern isn't symmetrical! So I usually have to tink back two of the three rows. It was worse before I realized the lack of symmetry when I couldn't figure out why my counts were so off and had to go back to start on Every. Freaking. Row. If anyone knows where my camera is, let me know and I'll be happy to take better shots. I think Kaffe designs these things as a cruel joke. "Let's see what idiot will wast one year of their life trying to knit this and then end up frogging it anyway because it's drop-sleeved and not at all fitted like on the model." Oh, didn't I mention it's drop-sleeved and not at all fitted like on the model? I'm going to try to modify it to be a raglan because that's what it looks like it should be. Those "seams" going up where the shoulder seam should be in the photo are fake. I'm just nervous that I'll run out of pattern on the sleeves and have to fudge it. I'm not worried about the lack of shaping, as I'm sort of rectangle-shaped myself.